The author’s work has received literary recognition from the World Book Awards, USA Book News, Premier Books, Book&Authors.net, and the Hollywood Book Festival over the past year. The libraries of the Academy of Motion Picture Arts and Sciences, the American Film Institute, the Screen Actors Guild Foundation, and the Writers Guild Foundation have also added the honored paperback to their prestigious shelves. 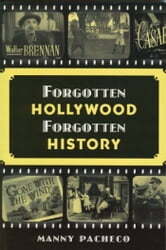 The book can also be found at the Hollywood Heritage Museum, and the Paley Center for Media in Beverly Hills. Pacheco is a 29-year member of the Screen Actor’s Guild, and has worked as a broadcast personality in Los Angeles for three decades. He’s appeared on NBC’s Santa Barbara, and co-hosted the Daytime Emmy-nominated In Studio on KCOP. The acclaimed scribe recently appeared on FOX 11’s Midday Sunday to chat about his writings. He currently hosts a weekly radio show appropriately called Forgotten Hollywood.